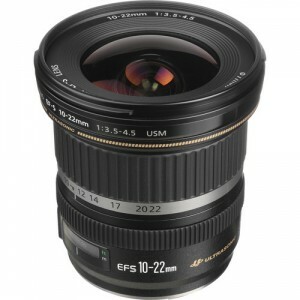 The Canon EF-S 10-22mm f/3.5-4.5 USM lens is an ultrawide angle lens designed for APS-C mount Canon cameras such as the Rebel series and the 30D, 40D, 50D, 60D, 70D, 80d and 7D/7DII bodies. This lens is somewhat fast with an f/3.5-f/4.5 aperture. I have not formally reviewed this lens yet, but overall, owners of this lens seem to rate it pretty well. If you are considering this lens be sure to check out my side-by-side comparison with the Canon EF-S 10-18mm f/4.5-5.6 IS STM lens. based on 1503 user reviews online.